The head is broad between the ears with a slightly domed skull. Total length of head from occiput to end of nose is 9 to 10 inches in males and 8 to 9 inches in females. Muzzle is long, broad and deep, square in profile with flews that well cover the line of the lower jaw. Depth of foreface should be 3 to 4½ inches. Nose: large with well opened nostrils. Fully pigmented, black in colour. Rather large, set wide apart in skull. Round in shape and dark brown in color (never lighter than light brown). Eye rims tight and close fitting. No excess third eyelid should be apparent. Expression is a typical pleading hound expression, never wild or cowering. Set low and devoid of erectile power. Should be thin with a slight roll, taper well towards a point, and reach well towards the end of the nose when pulled forward. Well attached to head to prevent hanging or backward tilt. Teeth: Scissors bite preferred, even bite acceptable. Undershot or overshot are disqualifying faults. Muscular and of moderate length, tapering slightly from shoulders to head. Carried well up but not vertical (goose necked). Throat clean with only a slight trace of dewlap. The body should show considerable depth (extending well down toward the elbow), rather than excessive width, to allow for plenty of lung space. Forechest is moderate, fairly even with the point of the shoulder. Girth of chest for males is 26 to 34 inches, for females 23 to 30 inches. Ribs are long and well-sprung, tapering gradually towards a moderate tuck-up. Back is muscular and topline slopes downward slightly from withers to hips. Loin is broad, well-muscled and slightly arched. Preferred color is a dark blue, thickly mottled body, spotted by various shaped black spots on back, ears and sides. Preference is to more blue than black on body. Head and ears predominately black. 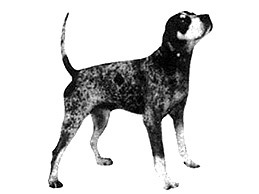 With or without tan markings (over eyes, on cheeks, chest and below tail) and red ticking on feet and lower legs. A fully blue mottled body is preferred over light ticking on the body. There should be more blue ticking than white in the body coat. No other colors allowed. Proportion (measured from point of shoulder to base of tail and withers to ground) is square or slightly longer than tall. Any color other than that described in the standard. Albinism.